As usually, I tried to end each wedding album with an epic shot. In this case, I asked the bride and groom to give me a few minutes during the wedding reception so we could take a picture of them in front of Roma's Hospitality Centre. Many times the bride and grooms are too tired to attempt such a quick photo shoot but in this case the newlyweds were happy to oblige. As such, we went in front of the building and create this image and literally five minutes. It portrays the bride and groom holding each other and touching foreheads in front of Roma's Hospitality Centre surrounded by a spiral created with sparklers. This shot conveys the message that the bride and groom might be still hogging in front of the wedding banquet hall even after the wedding. 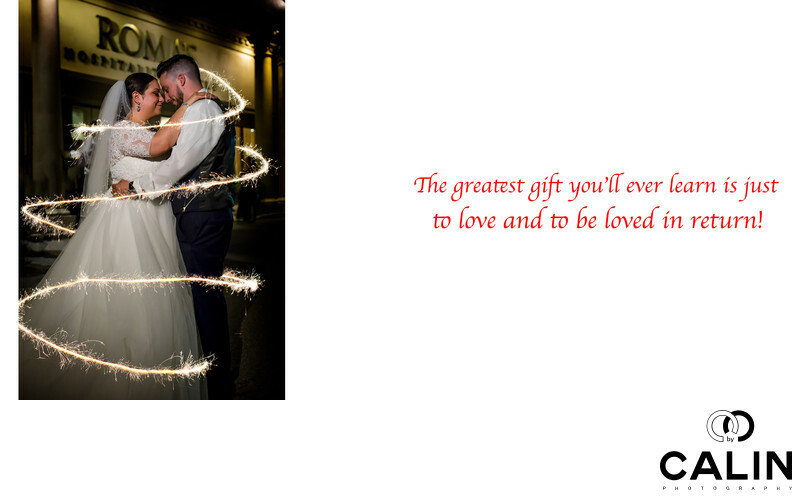 The sparklers are a welcome element of interest that adds complexity and value to this wedding shot. In order to create this image I use a Canon 35mm 1.4 lens shot wide open to absorb all the ambient light in the scene. In post production I adjusted the white balance in Lightroom, I added the vignette and removed some distracting elements in the background.